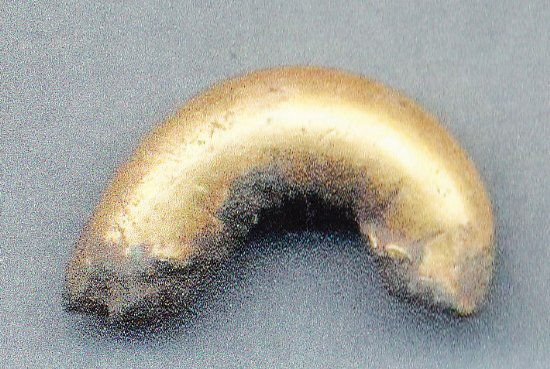 This fragment of a small gold ring was found near Cromarty. It probably dates to the Late Bronze Age (c. 1000-800 BC). Similar objects are found in gold or, as this case, copper alloy wrapped with gold sheeting. They are often interpreted as a hair rings, but their exact function is unknown. A number were found at Sculptor’s Cave, Covesea in Moray (not far as the crow flies from Cromarty). This cave had clearly been the site for ritual activities from at least the Bronze Age, and a rich array of objects and human remains have been found there. These included heads of children which seem to have been associated with these gold rings, hence suggesting they may have been hair rings. Another ring was found nearby at Clarkly Hill near Burghead. Similar rings are most commonly found in Ireland, but also in Scotland (including a recent find from Caithness), Wales, southern England, France and the Low Countries. Some examples are being investigated as part of a new project: The Gold in Britain’s Auriferous Regions, 2450-800 BC: towards a coherent Research Framework and Strategy project (see www.nms.ac.uk/prehistoricgold), where an example of a ring from South Uist is featured as one of the gold finds of the week. An example from Wales investigated for the project features on the National Museum of Wales website too. The finding of such a ring at Cromarty is quite intriguing, and shows the links across the firth to Moray. Photo courtesy of Cromarty Courthouse Museum.